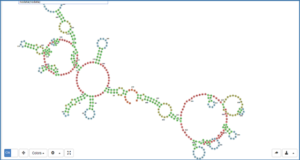 Long noncoding RNAs (lncRNAs) are essential in many molecular pathways, and are frequently associated with disease, but the mechanisms of most lncRNAs have not yet been characterized. Genetic variations, including SNPs and structural variations, are widely distributed in the genome, including lncRNA gene regions. 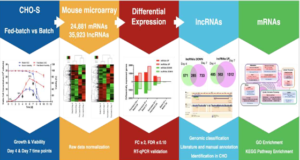 As the number of studies on lncRNAs grows rapidly, it is necessary to evaluate the effects of genetic variations on lncRNAs. Here, researchers from the CAS Key Laboratory of RNA Biology present LncVar, a database of genetic variation associated with long noncoding genes in 6 species. 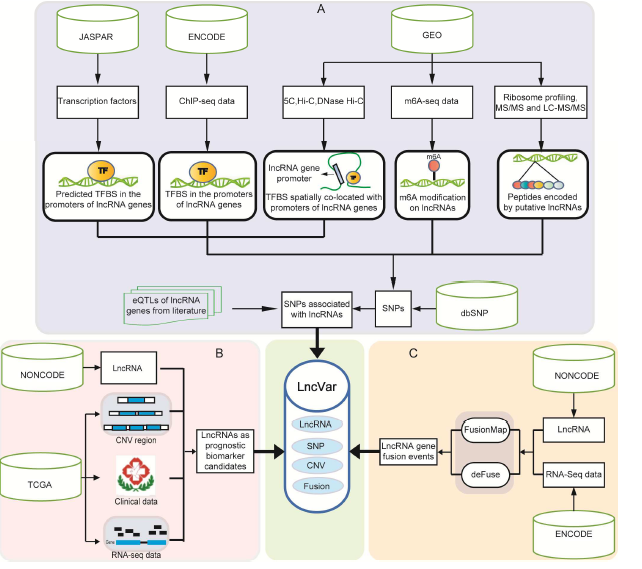 They collected lncRNAs from the NONCODE database, and evaluated their conservation. They systematically integrated transcription factor binding sites and m6A modification sites of lncRNAs and provided comprehensive effects of SNPs on transcription and modification of lncRNAs. They collected putatively translated open reading frames in lncRNAs, and identified both synonymous and nonsynonymous SNPs in ORFs. The researchers also collected expression quantitative trait loci of lncRNAs from the literature. 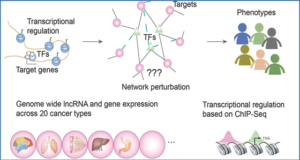 Furthermore, they identified lncRNAs in CNV regions as prognostic biomarker candidates of cancers and predicted lncRNA gene fusion events from RNA-seq data from cell lines. 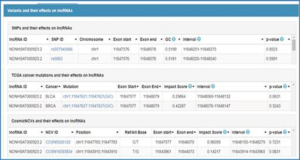 The LncVar database can be used as a resource to evaluate the effects of the variations on the biological function of lncRNAs. 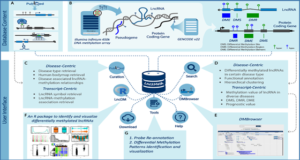 (A) Data processing of SNPs associated with lncRNAs. 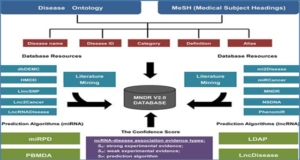 (B) Data processing of identifying lncRNAs as prognostic biomarker candidates. (C) Data processing of identifying lncRNA gene fusion events.